Jetstar arrived to a rainy winter day in Auckland. On a nice day from the domestic terminal over to international is a 15 minute walk. Today a crowded shuttle would take me there for an anticipated first time on the world renowned airline Emirates. 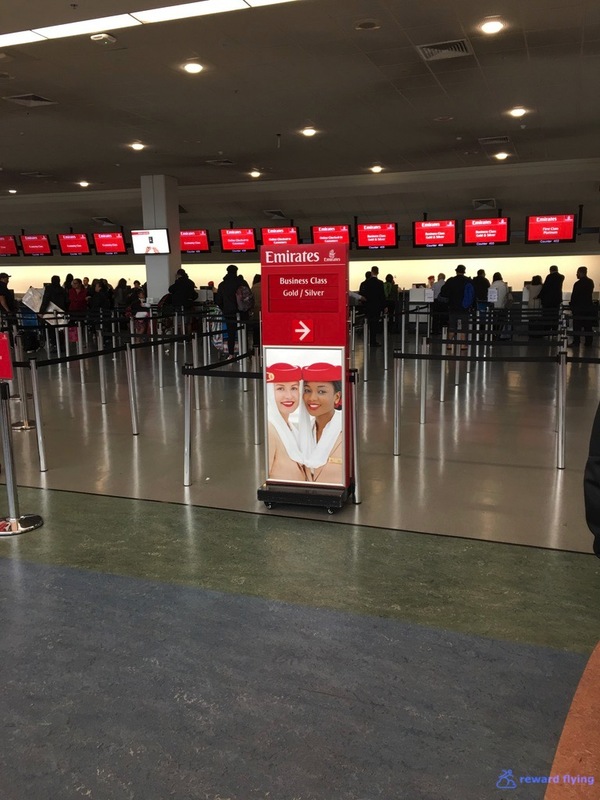 There were plenty of open aisles for the three Emirates A380 flights leaving this afternoon. Boarding pass in hand I was off to the Emirates lounge. 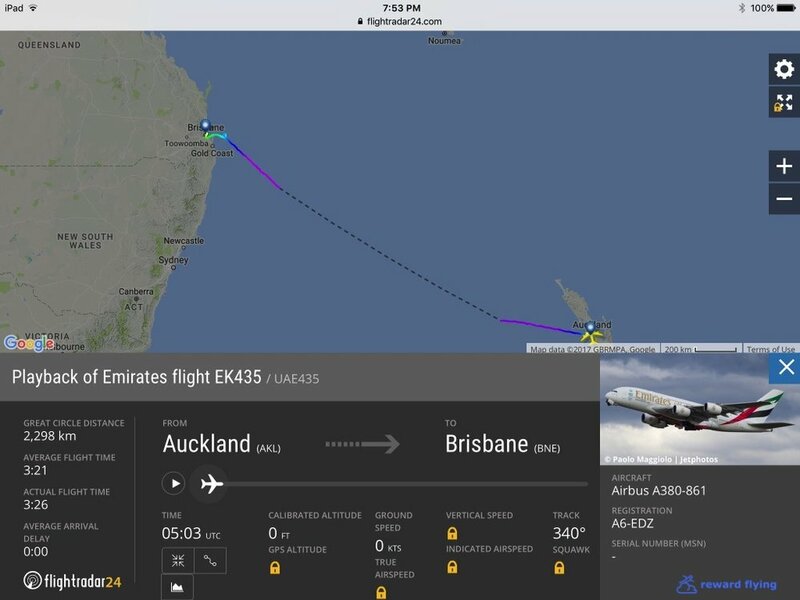 Recently Emirates announced the elimination of all 5th freedom flights from Auckland to Australia (Melbourne and Brisbane as Sydney had already been cancelled), leaving a single direct flight to Dubai from Auckland. 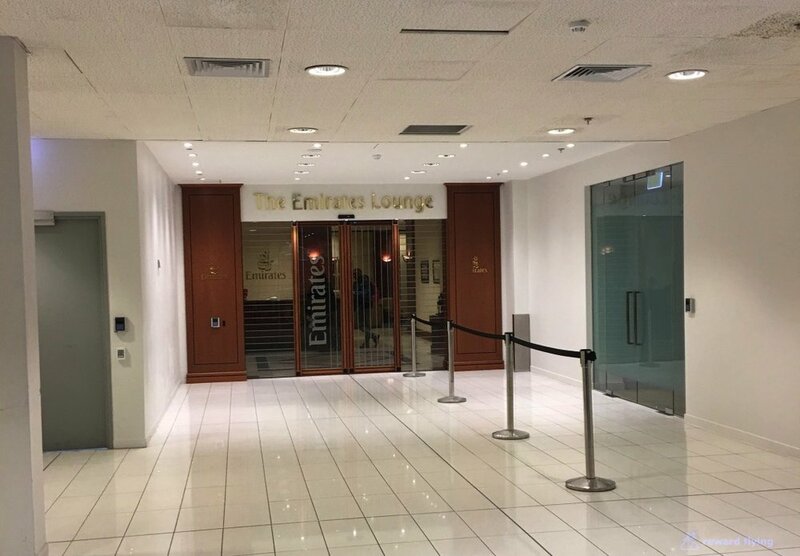 Given there is a huge Qantas lounge next to the Emirates lounge I wonder if this lounge will be closing. It is a beautiful lounge. Off to the side is a dining room but there isn't table service. 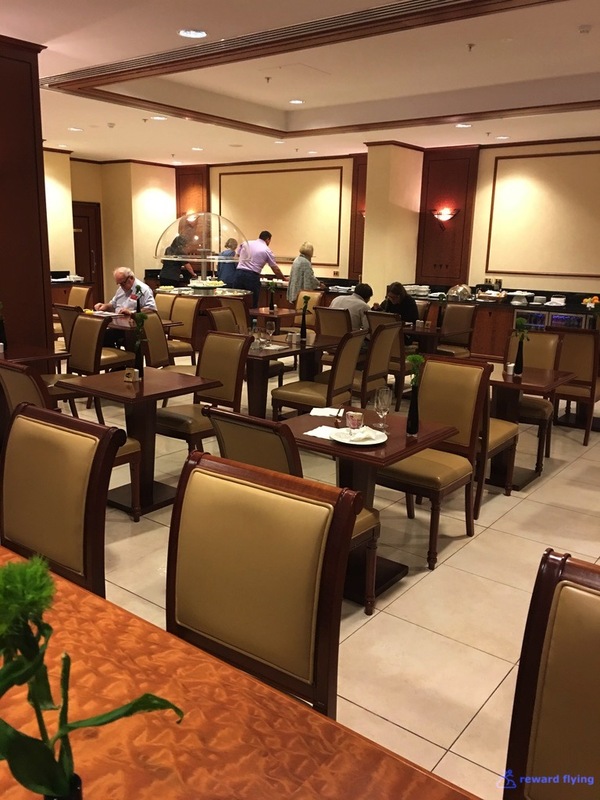 Yet it is nice to see a separate area to eat aside from the general seating area. 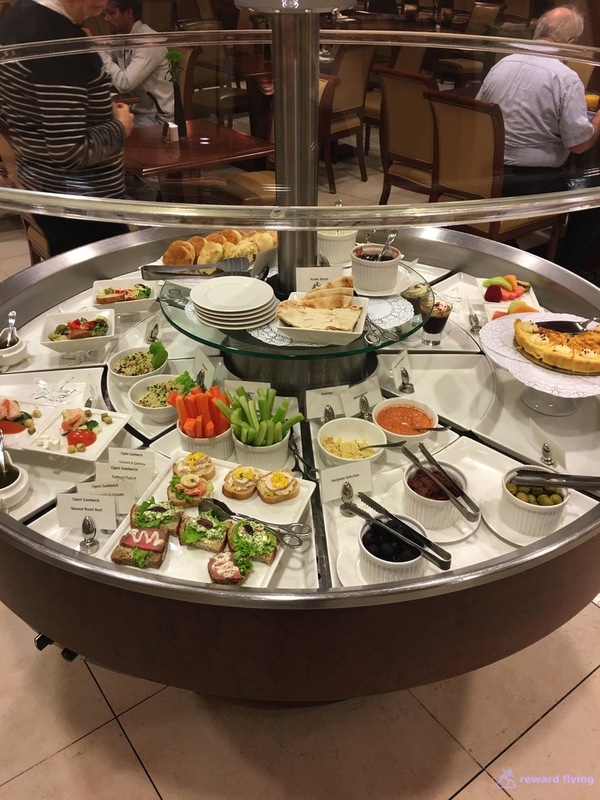 The food selection was impressive as was the manner in which it was offered. 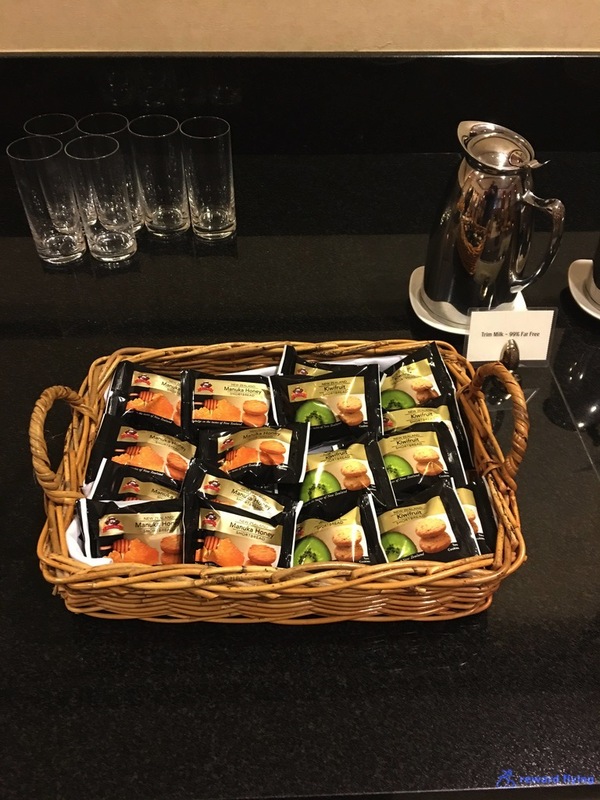 Only small servings were available at anytime and when items were taken they were quickly replenished with freshly prepared replacements. The lounge was also equipped with showers and private washrooms. Soon it was off to the gate where two massive A380s were parked awaiting their cargo. Mine would be the farthest out plus there was a third A380 parked on the tarmac just behind these, presumably for the direct flight to Dubai. 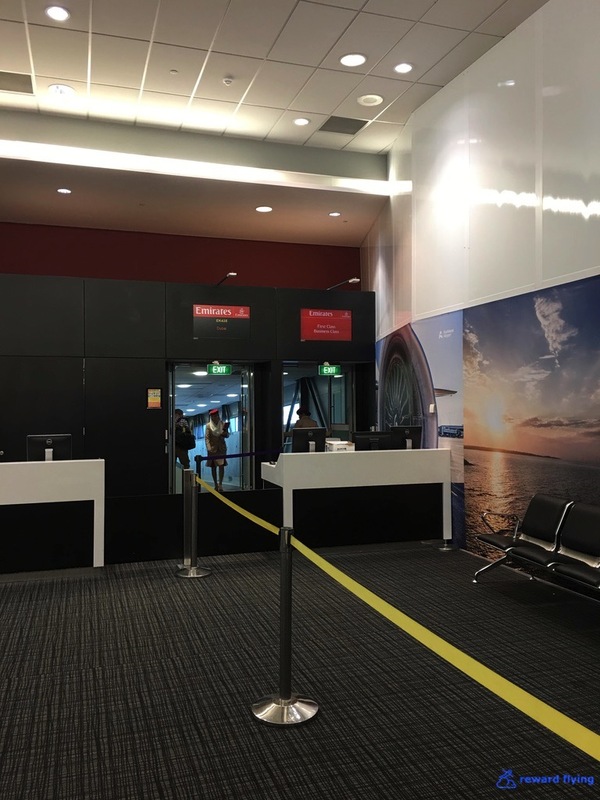 The gate area is huge. But today would not be utilized at maximum capacity, or even close. 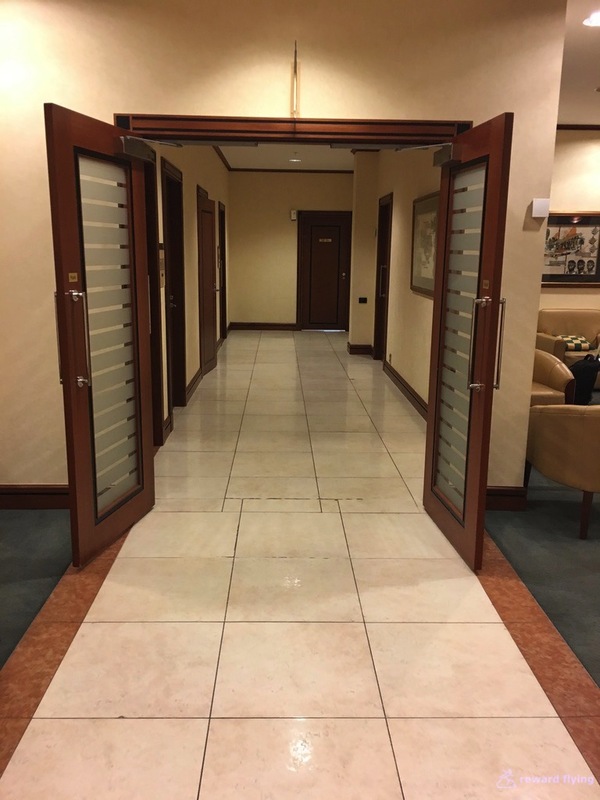 The left entrance went upstairs to first/business and the right entrance was main deck. The massive upper deck has 76 business class seats, 58 in the front cabin. I was in the intimate rear mini-cabin which has only 18 business class seats, 17 empty today. Lavatories aft are good sized for a business class cabin. 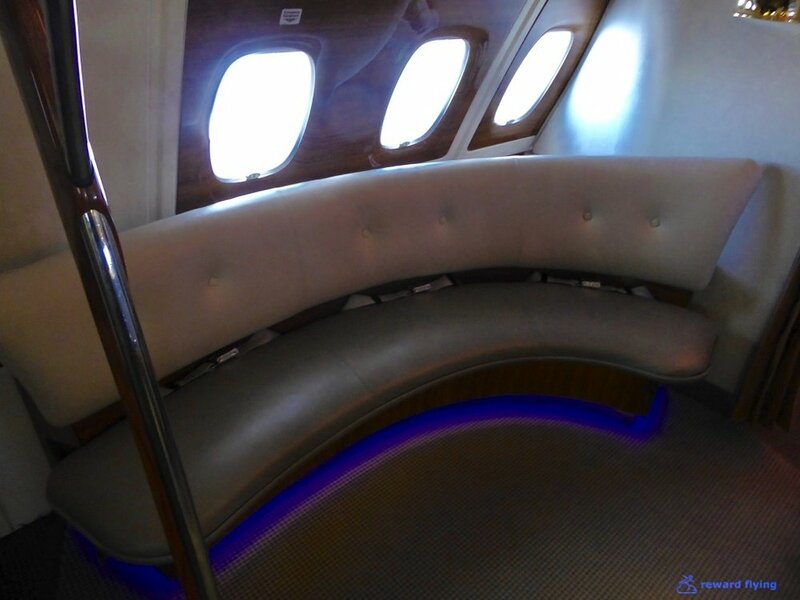 And of course the famous Emirates bar is in the back of the cabin. Today it would remain empty. Center seats have a privacy divider. 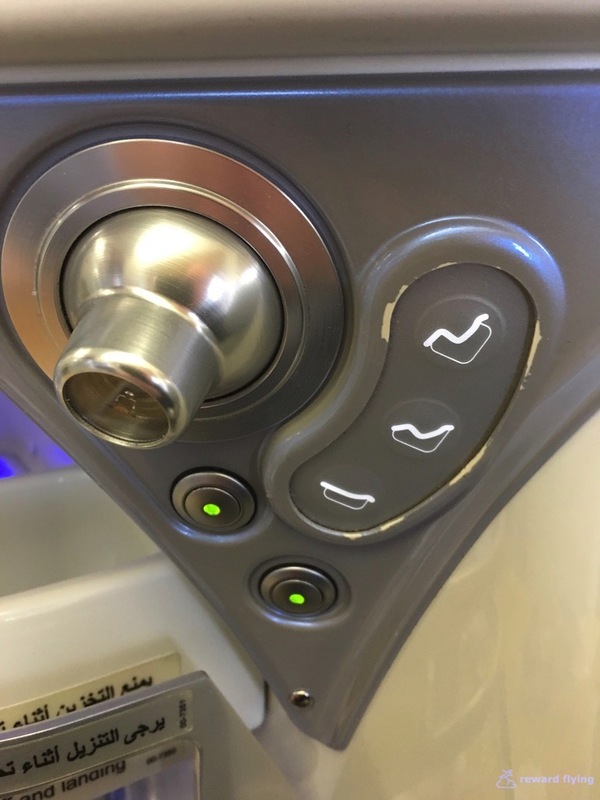 While pods with the seat against the aisle are exposed. Thus I would avoid any seat in rows 8 / 10 / 12 / 15 / 17 / 19 / 21/ 22 / 24 / 26 as this is your position to the aisle. Row 22 is a bassinet row, as is row 6 up front. In flight mood lighting made for a very pleasant environment for the handful of folks up front. And the single passenger in back. A peaceful time to enjoy a glass of bubbly. This plane had the older business class seats. They were in good shape, but still showing their age. It is reported that 23A/K have the most legroom of any business class seat. I can attest. 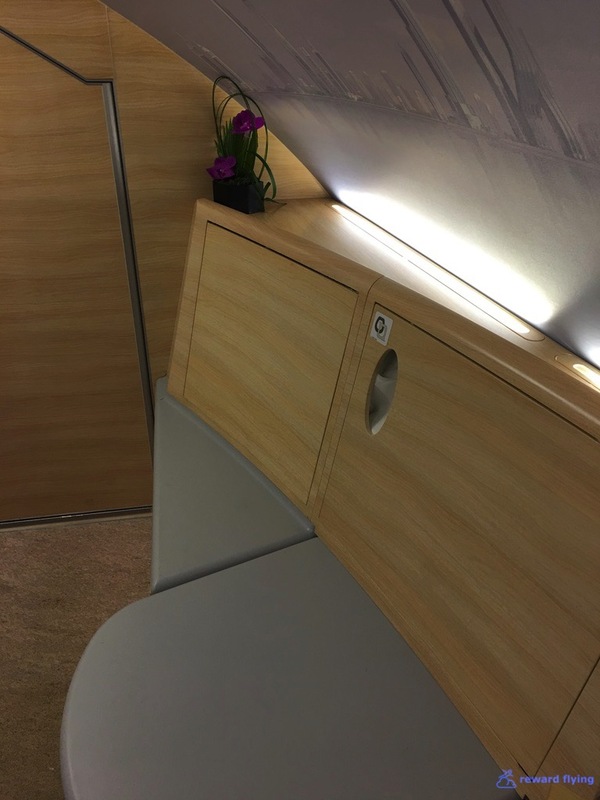 There's no question Emirates put plenty of thought into designing these pods. This appears to be a cedar plank inside the shoe box, that's what I mean about detail! Two side wall storage containers are available for true window seats. I can't believe Airbus wants to eliminate this feature on the proposed higher density A380, that will probably never get built. 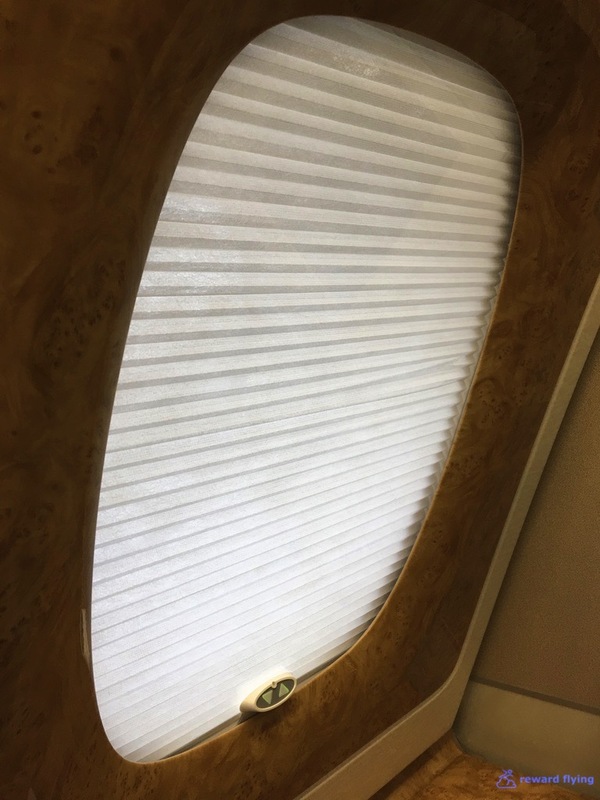 Push button window shades, but I still don't like the windows for viewing. These seats are based off the Skylounge III made by Zodiac. ANA uses a similar version in their staggered business class arrangement. And a tablet to control everything. I was very surprised at how heavy this device was. Plus it wasn't very responsive. As I said, these were the old seats. I'm sure numerous improvements have been made to these tablets in the new pods. 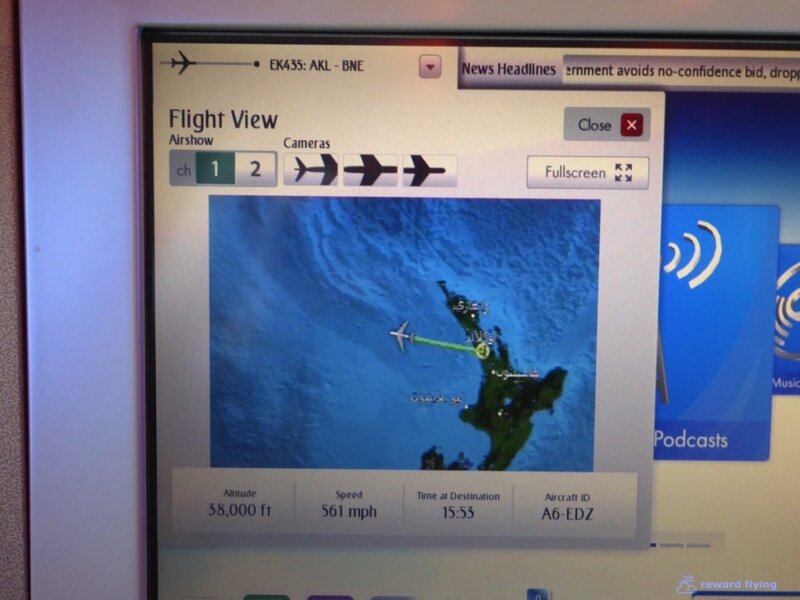 While the ICE IFE system has great reviews, I found it to be clunky to navigate. I must say, it's been awhile since I sat behind the engines. Airbus makes some quiet aircraft. After some bumps that I am quite sure were far more unsettling on a turboprop compared to this A380, we broke through the first layer of clouds. And headed off to the sunset. Marko was my flight attendant. He's in one of the photos above and reminded me that Emirates doesn't allow pictures of their crew. Whether or not that is true, my intention is always to blur the faces of any individual or crew member (including myself!). Marko was a great cabin attendant. Of course I was his only customer but hey, credit where credit is due. I started with a pre-departure champagne, although I don't believe I finished it. Once airborne I went old standby. 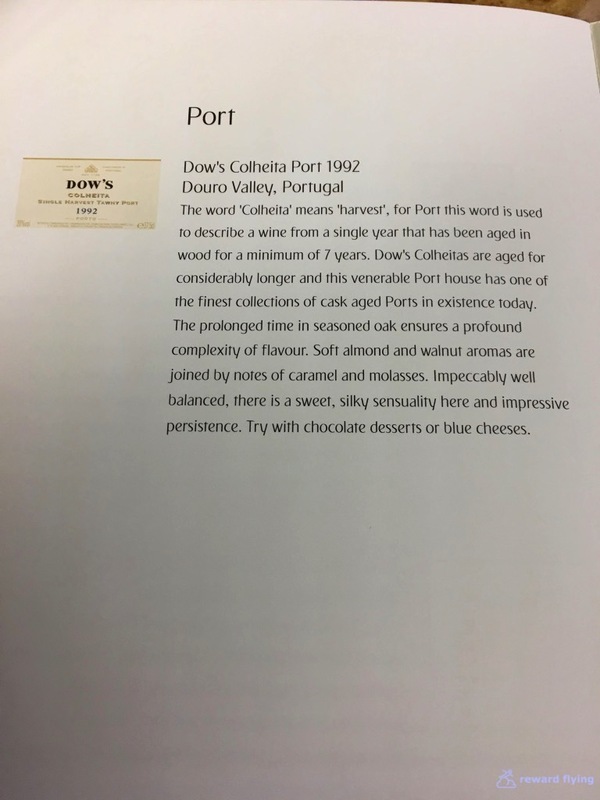 Marko suggested I look up this wine. 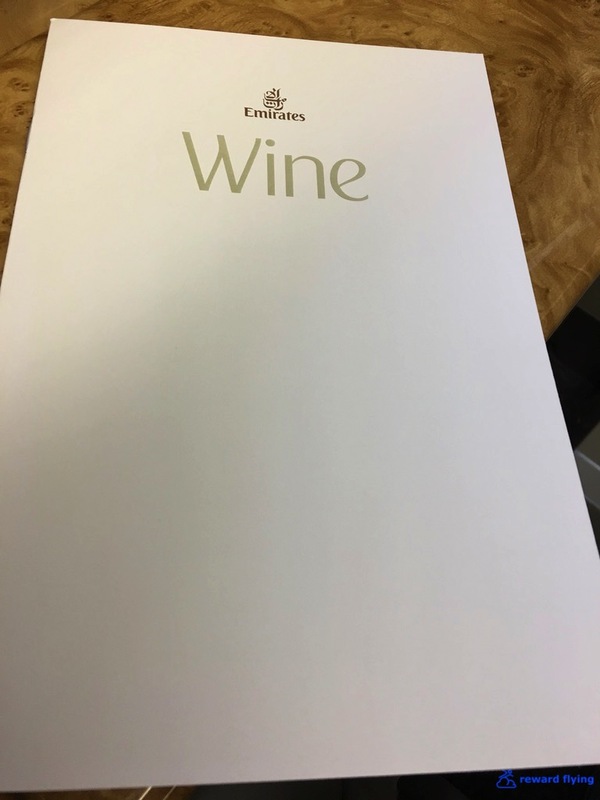 Wow Emirates, impressive! The food menu had a full page devoted to Custard Tarts. What version will it be? Lemon, not my fav but it will do along with the Pan-fried beef fillet. At least it wasn't cooked to oblivion as the charred outside suggested. It was tasty but simply horribly presented in an ocean of grease. Too bad the main meal wasn't as nicely presented and tasty as this dessert. While Sydney to Auckland is 2 1/2 hours with the jet stream, going against the winds and a little farther north is 3 hours and 20 minutes. We never caught up to the sunset. Cabin attendant Marko and I had some long conversations during the flight. 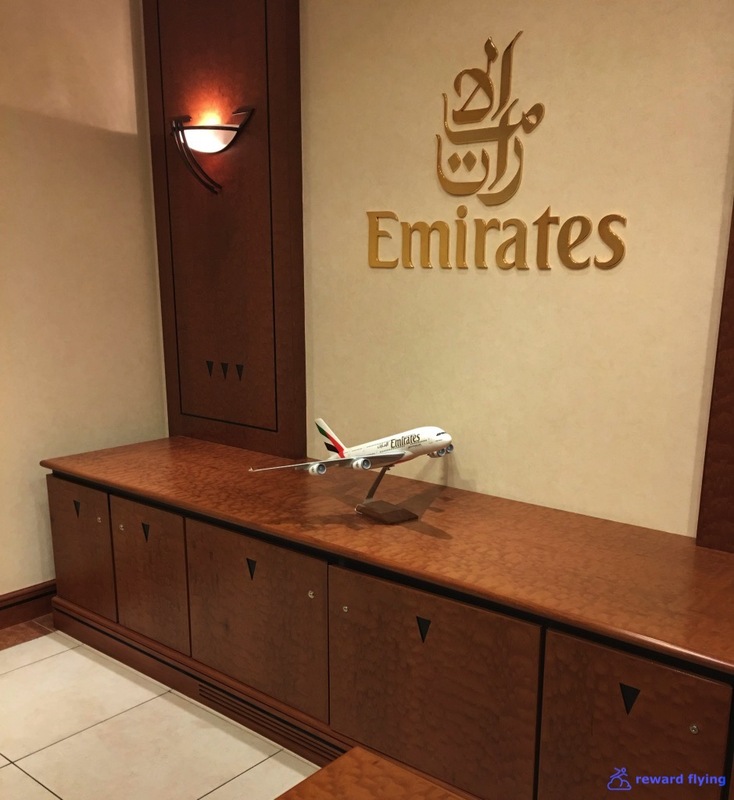 After hearing about my trip he arranged for me to tour the Emirates first class cabin on arrival. The ladies attending to first class (which I don't think had any passengers) were happy to show me around. While these seats look really nice, I was still surprised as I thought the suites were on the small side. 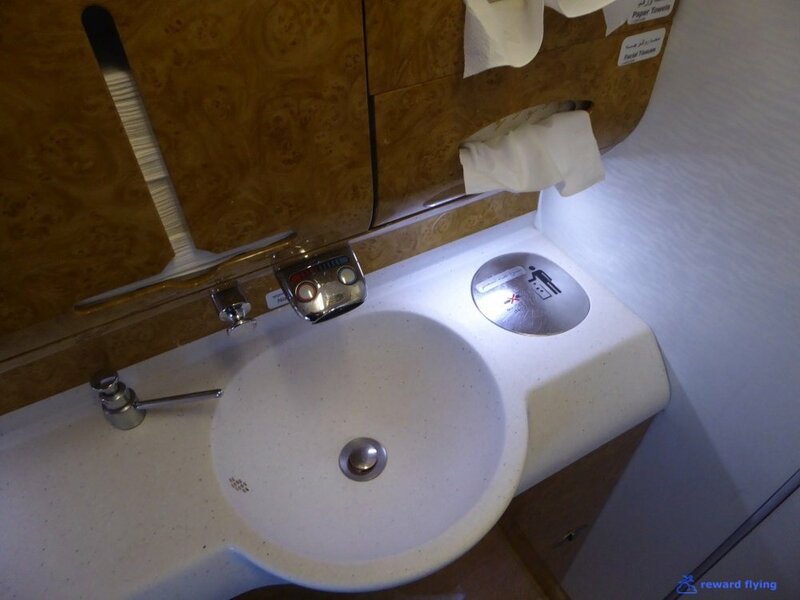 The lovely flight attendant was anxious to show me the built in amenity kit that's stored underneath the lighted mirror. Of course I wanted to see the shower so we headed to the lavatory. 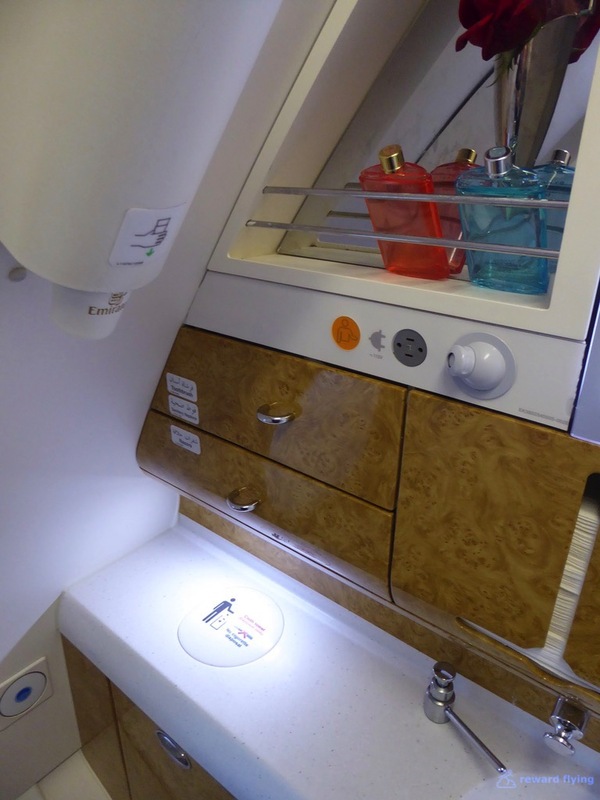 While the Emirates cabins are somewhat gaudy, I found the shower lavatory to be nicely understated. 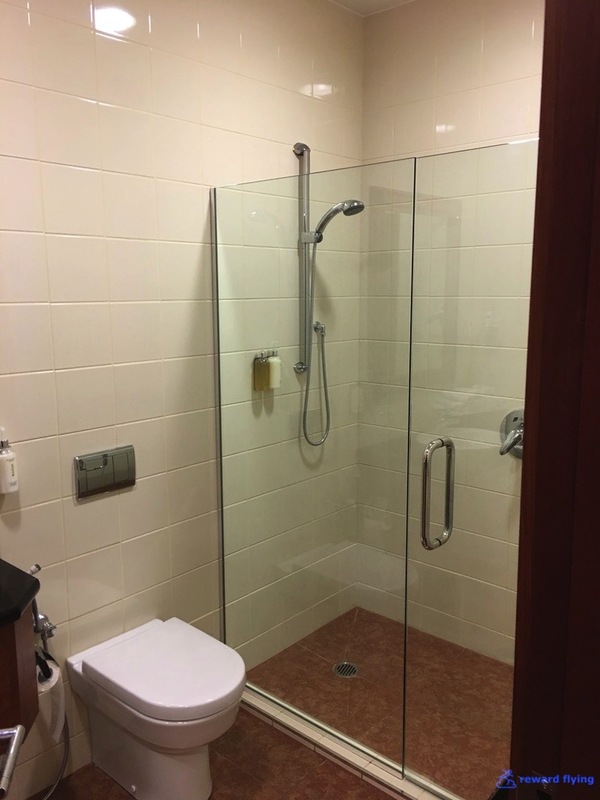 And of course the shower. Feeling uncomfortable because the plane had emptied and the crew was probably wanting to do the same, I thanked the two ladies who showed me around and exited Emirates, not really sure if I have the desire to fly them again. And I'm not sure why, I'm not sure. 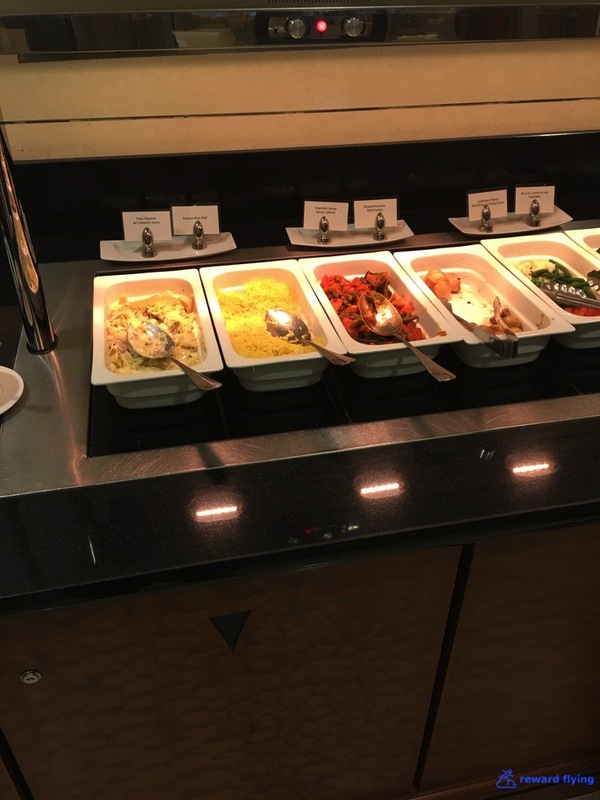 However I feel I got the best bang for my points as a straight redemption is 36,000 Emirates Skywards points plus about $50 in taxes and fees, so I saved 20,000 points for $150. On top of it I credited the flight to Alaska and received 2,690 points. ✔︎I loved the mini-cabin in back. Choice seats on a long haul if you can get it. ✔︎These were the old seats but still functional and comfortable. I can only assume the new version is better. ✔︎I forgot to brush up on my swimming skills. Horribly presented meal. 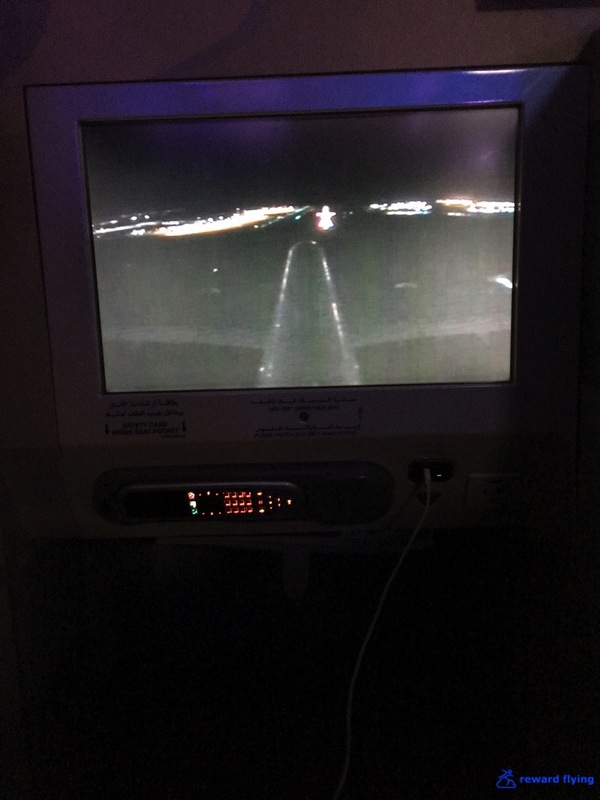 Tell us about your Emirates experiences. Feel free to leave a comment below.